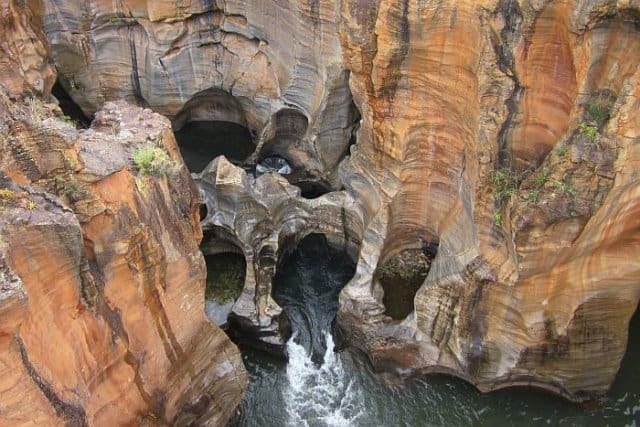 Blyde River Canyon Tour offers magnificent landscapes and scenic landmarks. Experience the natural wonders of one of the largest canyons in the world. Scenic drives and walks in the Blyde River Nature Reserve and the Panorama route. The Kruger Lowveld area The Blyde River Canyon is in the Kruger Lowveld. It is a region of superlatives. 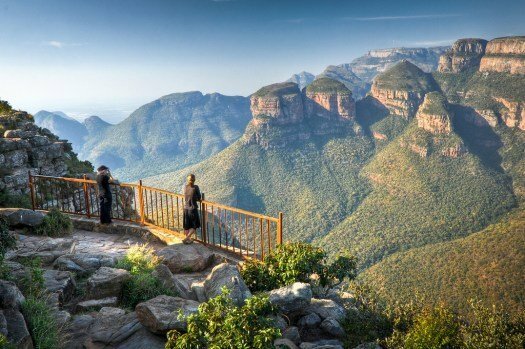 From the Great Escarpment’s scented forests and tumbling waterfalls, to the majestic Blyde River Canyon with its endless vistas over the Lowveld; from the southern reaches of the Kruger National Park, where it abuts the rolling cane fields of the Onderberg, to Barberton, in the lea of some of the world’s oldest mountains and the memories of the thrilling Gold Rush that once took place here. Blyde River Canyon The Blyde River Canyon is one of the largest canyons in the world (now renamed Molatse River Canyon). It is within the Blyde River Nature Reserve. 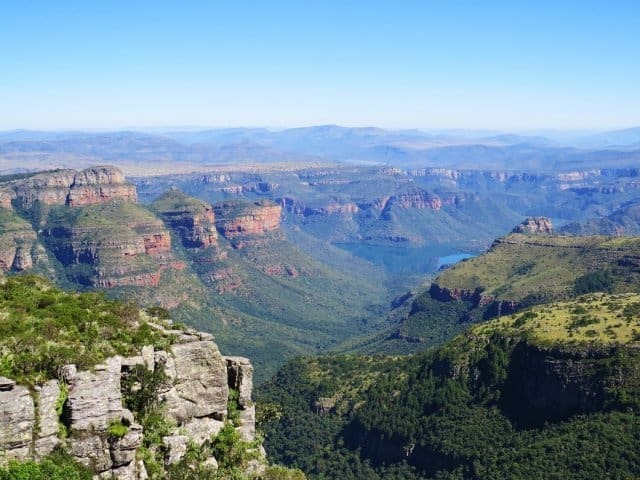 The 29 000 hectare Blyde River Nature Reserve rests against the Greater Drakensberg escarpment and preserves not only the canyon but other natural wonders of Mpumalanga. The beautiful Panorama route offers magnificent landscapes and scenic landmarks like Three Rondawels, Bourke’s Luck Potholes, Lisbon Falls, Wonder View, God’s Window and the Pinnacle. Game Animals exposed, fabulous photos, wild walks and bright-plumed birds. South Africa is globally renowned for its phenomenal game viewing and sound conservation ethics. Birds The Kruger Lowveld region has some of the most diverse habitats in South Africa and boasts an impressive bird list of close to 600 species. Birdwatchers will be able to get a closer look at interesting bird species eg: Trumpeter Hornbills, Narina Trogon, Crowned Eagle, Half-collared Kingfisher, African Finfoot. Accommodation Stay in some of the area’s finest lodges. 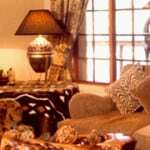 Culture and history The Kruger Lowveld is also a place of historical and cultural significance. Iron Age trade routes and African traditions reach back across many centuries. Gold rushes at Pilgrim’s Rest and Barberton were precursors to the discovery of gold in Johannesburg. Steeped in the history of traditional cultures, pioneers and fortune seekers, visitors will encounter a contemporary Lowveld culture with a wealth of stories that inspire the senses and connect them to the land and its people. 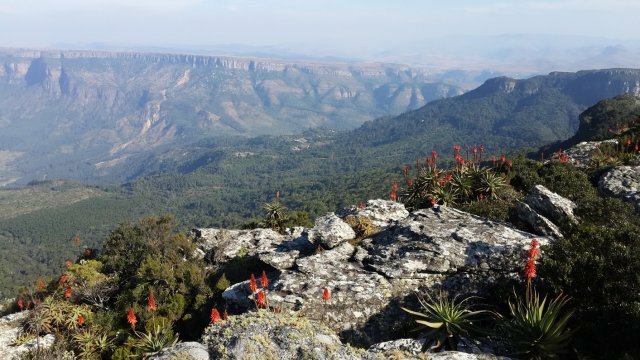 The Panorama Route: you will be picked up after breakfast and enjoy a scenic drive upwards through the mountains towards the escarpment from where panoramic views of the Blyde River Canyon will greet you. You will visit the “Potholes”, God’s Window and Berlin Falls along the way then break for lunch in the small town of Graskop before returning to the lodge. Short hikes of 1-2 km at each stop along the route. Today’s trip will take us on an early 4 km walk to a waterfall in the Swadini Valley before taking a 2 hour boat trip on the dam which covers the base of the Blyde Canyon. We will discover Tufa waterfall and see some hippos and maybe a crocodile or two. Lunch will be at Moholoholo-ya-mati on the Blyde River. We will start off mid-morning to pay a visit to a special animal rehabilitation centre ( Moholoholo) where you can interact with large birds of prey, cheetahs, vultures and whichever orphaned baby animal that are in their care (hippo, rhino, giraffe or zebra). After lunch at the Baobab Restaurant we will pay a visit to the world renowned Hippo called Jessica. You can feed, touch and even give this wild Hippo a massage with your feet. Self-guided walk from your lodge. Rates are quoted per person for two people sharing and are subject to change without prior notice. Rates include government taxes, where applicable. If taxes increase, we reserve the right to increase the rate accordingly. Accommodation in twin rooms, all meals, guide and guiding fees, all-day transfers between pickup and drop-off, entrance fees to reserves and attractions. Items not mentioned above, eg : Transport to and from Johannesburg or Nelspruit or Hoedspruit, medical and travel insurance, drinks and alcoholic beverages. Overall rating: “Easy”. You do not need to be ultra-fit but if you choose to do the walks you should be able to walk between 10 and 20 km per day. The route takes you along paths, tracks and through the veld. See Walking grades for more details about “Easy” rating. Alternatively you can add attractions in the vicinity to your program-before or after the tour. We can recommend a number of interesting options and can assist with bookings to compliment your Blyde River Canyon Tour Kruger. The costs of these options are available on request. Bookings can be made throughout the year. Mild winters, with chilly evenings The summer months (September to April) are hot with occasional rains. Fly to OR Tambo International Airport. From there an internal flight to Hoedpruit or we can arrange a transfer from Johannesburg to Hoedspruit or you can self-drive. Comfortable, well ventilated clothes in keeping with the season. Wear neutral coloured clothing. Always bring a thick windbreaker/jacket, good walking boots (already worn-in), hiking sandals and several pairs of cotton or wool socks. For your daily needs, you are advised to have a day-bag, a plastic bag to waterproof your day-pack, sun-hat, sunglasses, sun block, a water bottle, personal first-aid kit, camera, binoculars. A torch and headlamp are important. Basic solar heating is provided. Cell phone charging facilities available. Blyde River Canyon Tour is a unique wildlife experience.